A new exhibition in Union Station, The Makers: Portraits of Metro artists whose work enriches the rider’s journey, and a special series of Artists Conversations will provide a unique opportunity to learn about the remarkable range of artists creating distinctive works that add vibrancy and foster a sense of place within the Metro system. The portraits were created by Los Angeles-based Todd Gray, a professional photographer and internationally exhibited artist. The work will be on view in the passageway connecting Union Station East and West beginning on Thursday, Aug. 25. Reflecting the diverse communities that make up Los Angeles, the featured artists span multiple generations and come from a variety of backgrounds. Some are emerging artists who are relatively new to public art, such as Christine Nguyen and Carmen Argote, while others are more established, like Judith Baca, Bill Bell, Charles Dickson, and Alison Saar. The range of the group is a testament to the high concentration of creative talent living and working in Los Angeles today. The artists’ work can be seen throughout the Metro system from the San Fernando Valley to Long Beach, and from Santa Monica to Monrovia. Some of the work is permanently built into the station architecture while others were temporary projects such as art posters inside buses and trains, or murals surrounding Metro construction sites. All of the artworks strive to humanize the transit environment and make the experience of riding Metro more engaging and more enjoyable. The following artists are included in The Makers: Carmen Argote, Judith Baca, Bill Bell, David Botello, Charles Dickson, Roy Dowell, Martin Durazo, June Edmonds, Cheri Gaulke, Ken Gonzalez Day, Phyllis Green, Clement Hanami, Wayne Healy, Phung Huynh, Joe Lewis, Ronald Llanos, Man One, Michael Massenburg, Jessica Polzin McCoy, Christine Nguyen, Noni Olabisi, John Outterbridge, Sam Pace, Sonia Romero, Sandra Rowe, Alison Saar, Shizu Saldamando, Peter Shire, May Sun, Cha-Rie Tang, and Richard Wyatt. Metro artists play a major role in placemaking, helping to define L.A. neighborhoods through artworks that are thoughtfully integrated within stations, on trains, buses and other transit facilities throughout greater L.A. This special series of conversations with Metro artists provides a unique opportunity to learn about the people behind the artworks in the fast-growing Metro system. Hear their stories and learn about their concepts and processes. 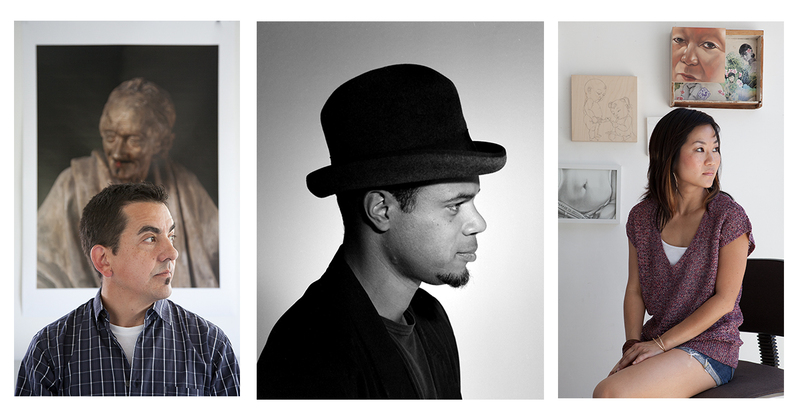 All conversations are free, open to the public and take place in Union Station’s Historic Ticketing Hall, 7 – 8:30 p.m.
A native Angeleno, Todd Gray works in multiple genres including photo-based works as well as sculpture, paintings, performance and public art. He began his career as a rock photographer before his friend and mentor, Ray Manzarek (keyboardist and co-founder of the Doors), convinced him of his talent as an artist. Gray went on to pursue both interests–exhibiting in museums while photographing countless album covers and directing music videos. Gray’s work has been featured in numerous solo and group exhibitions nationally, and included in many public collections including the National Gallery of Canada; San Francisco Museum of Modern Art; Los Angeles County Museum of Art; Museum of Contemporary Art, Los Angeles; and the Studio Museum, Harlem. He is a 2016 Rockefeller Bellagio Residency Fellow (Lake Como, Italy). Gray maintains studios in Inglewood and Ghana. What a bunch of sad faces. It just goes to show, no one happy in LA.